Power: if you appreciate strong coffee, please, choose a low power electric percolator (750-800 Wt), and vice versa. Carafe type: most of them are made of glass or plastic, and some can even be put in a microwave oven. Some drip appliances feature a thermal carafe, which keep the drink hot for several hours. Carafe handle: it should be made of a heatproof material, so that you will not burn your hands when pouring coffee. Carafe volume (capacity): it depends on how many people are going to have coffee at a time. It ranges from 5 to 15 cups. The most important thing is that you always brew coffee based on carafe volume, as the user guide says. If there is not enough water, it will just seep through the grains too fast and make your drink too thin. Vice versa, too much water can bring coffee particles in the carafe. Filters: enjoy the freedom of choice. 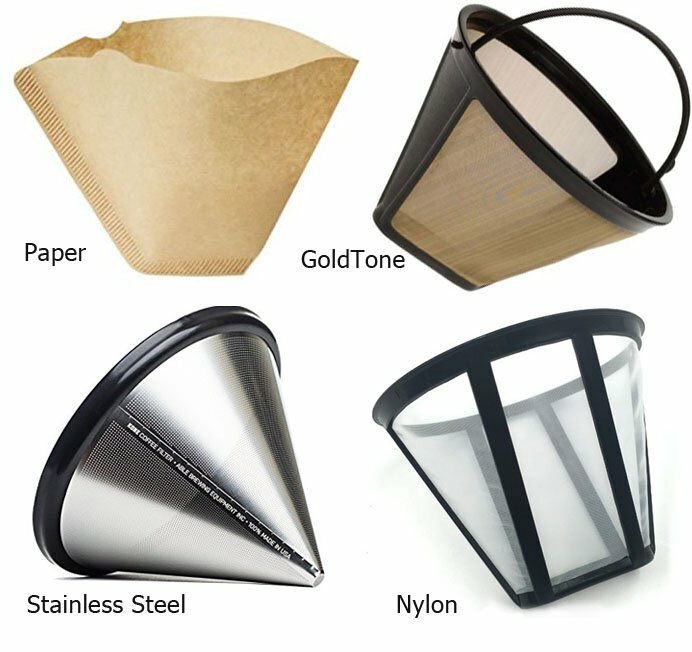 There are disposable (they do not require cleaning), nylon (intended for about 60 uses), and metal (they have an alloy covering, which significantly increases their life) filters. An anti-drip system will prevent coffee from escaping when you need to remove the carafe and pour yourself a cup while it is still brewing. A warming plate or thermal carafe will keep your drink hot for a long time. Geyser mocha pot look like regular porcelain coffee pots. Some of them are non-electric and can be warmed on a stovetop. However, an electric percolator works on the same principle as a non-electric one. Geyser appliances feature a metal chamber, a percolator coffee pot and a separator that keeps water apart from coffee. The chamber is filled with cold water. As it is heated up to the boiling point, it begins to rise and then saturates the coffee powder. There are appliances, which do the procedure more than once. In other words, boiling water flows up a tube, then onto the powder and seeps back down into the chamber. The cycle repeats itself several times. However, best quality geyser percolators make a single cycle. They make very rich and fragrant drink. Capacity is as important in geyser appliances as it is in drip ones. If you use a 5-cup percolator, you need to brew just as much coffee each time. The handle must be made of a heatproof material. The water level indicator shows the amount of water in the basket and signals when water needs to be added. The lid should not get too hot and must have pivots, so you can remove any time you need to check water- or coffee level. Manufacturers do not hesitate to use beautiful and brightly colored design solutions, and some appliances can pretty much decorate your kitchen. Percolators have become popular in Italy and therefore are known as Italian coffee makers. Italians have several cups of aromatic drink each day. And one more thing: coffee builds up on the parts directly contacting it and affects the drink’s taste. Please, remember, that drip and geyser appliances need to be rinsed regularly. Make sure that these parts are removable and will make the rinsing process convenient. Fairly good quality. You pour cold water into it, then is heated up, and coffee is brewed right in the maker. You do not need to boil water in a kettle. No coffee grounds in the cup. It will not overflow or stain your oven, as Turkish pots do. All types of grinded coffee are ok. It makes high quality sediment-free coffee. You can make a large volume of drink at a time. You can buy a high quality geyser appliance at an affordable price. The brewing process is safe, and even kids can handle it. It can make several portions at a time. Relatively affordable and user-friendly. You can make other types of drinks like tea, herbal tea, etc., with this kind of machine. No matter how much coffee you load into it, it never goes beyond medium strong, so it will not give you an espresso. The technology leaves zero chance for strong coffee. Some people may find it too slow, because it takes 5 to 15 minutes (depending on the model) to make a cup of hot drink. The drink’s taste, although the brewing does take place, is plain French-press. Because water does not fully absorb the flavor of ground beans, the drink does not always get rich enough. To clean a device, you have to disassemble it after every use. You have to check and replace filters from time to time. To ensure stable functioning, you have to replace the filter and gasket from time to time. You cannot make a smaller amount of coffee than specified by a scale mark on the reservoir. Not all portions will boast a rich flavor.